String Cheese can be a great snack for back to school lunches however it always runs on the expensive end so never pass up an awesome deal on string cheese like this one. As Harris Teeter shoppers probably already know by now, this past week was Super Doublers week! Ending today, 8/20, Harris Teeter will fully double coupons with a face value of up to $2.00! Sorrento String Cheese 12-count packages are on sale for $3.50 through today, 8/20. 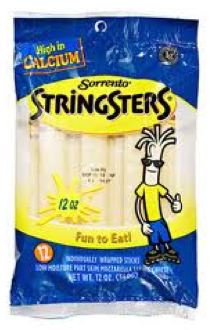 Use the $1.50/1 Sorrento Stringster or Sticksters Snack Cheese from this past Sunday’s Smart Source insert (8/18) to score this string cheese for only $0.50 a package! Definitely stock up price. Remember, this deal is through the end of the day today only! Be sure to check out the rest of the Harris Teeter Coupons & Deals for this week before you shop! Don’t have a Harris Teeter in your area? Check the Grocery Price Comparison Tool to find the best deals on this product at your local stores.